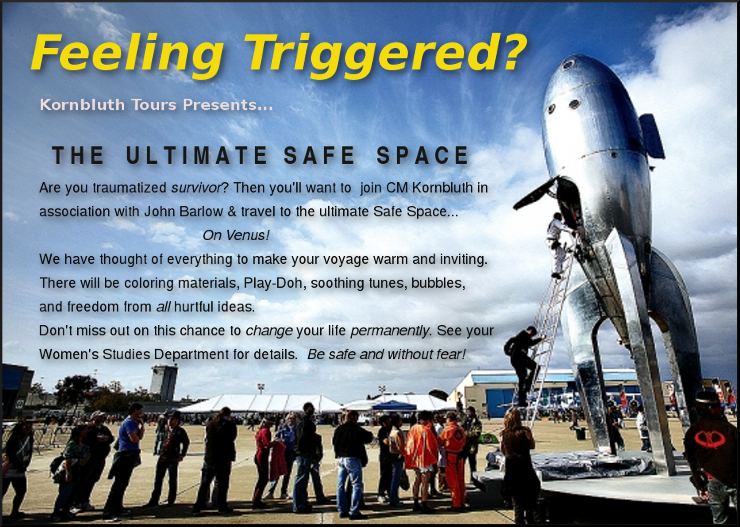 Hey, Triggered College Kiddies: Come To The Ultimate Safe Space! The solution to the problems all universities are having. More than related: Universities? Nuke ’em From Orbit. It’s The Only Way To Be Sure. Tell the kiddies it’s a chance to reconstruct the life on Venus previously destroyed by the runaway greenhouse effect created by the previous occupants. It’s a chance to show how loving and caring and wonderful these kids are. Get them singing Kumbaya and send ’em off. Don’t forget to mention Venus is our sister planet—they’ll love that! I was sorely disappointed when Ray Bradbury’s vision of Venus turned out to be not right. The Marching Morons is one of my favorite short stores. *Stories*. Your enemies have reached the comments section already. Venus? “Warm and inviting”? Venus? I like it. C.S. Lewis’s vision of Venus (Perelandra) is better than Kornbluth’s, but not suitable for present-day college students. Nate, sorry…I didn’t see your reference to “Marching Morons”. No problem Bob – I enjoyed the reread just as much. Upon rereading I realized that Mike Judge’s Idiocracy owes a lot to The Marching Morons – between the advertisements and the language, it’s a very similar world (with no smart elite in Idiocracy to balance out the idiots). I just finished the story and had the same thought. “Welcome to Costco, I love you”. In response to Nat and Bob Kurland. When I first read “The Marching Morons’, I laughed at the farce , but lately it seems to be stark, terrifying reality. I love Costco. I sit down and eat my $1.49 Polish Dog and Coke and watch the crowds swarming out. The world can’t be that bad off when so many people are in there. I still get flustered trying to explain to people that the reason that Venus is so hot is not because it has so much Carbon Dioxide (ppm), it is because it has so much Carbon Dioxide (kg). If we had as much Nitrogen on this planet as Venus has CO2, we would be burning up also. Of course we wouldn’t be, because we wouldn’t be here. Suddenly we are in Briggs lessons on philosophy!